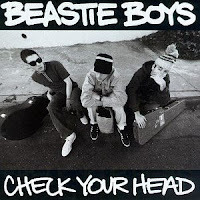 Laid Off Loser: Laid Off Loser Album of the Day: "Check Your Head"
Laid Off Loser Album of the Day: "Check Your Head"
Dude, the Beasties' best album is back on wax. Live instruments, funk grooves and the masterful coalescence of the varied music styles that influenced them. All on two platters of 180-gram virgin vinyl. Quintessential 1992. Drop the needle and dig the grungy time travel.